A FEW MONTHS BEFORE I HIT THE ROAD, MY NEPHEW JOSH CAME UP FROM ORANGE COUNTY TO SPEND THE DAY WITH HIS UNCLE BOBBY. For some reason, he’s got it in his mind that I know all these famous people and I live a glamourous life. One day the kid will figure it out. Until then, the illusion lives on. To perpetuate the myth, I took him to breakfast at the Newsroom, a healthy low-key celeb hangout and one of my favorite dining spots back when I was actually sleeping in the same bed every night and paying rent in lovely Beverly Hills Adjacent. We weren’t at our table more than 2 minutes when Josh noticed a young kid at an outdoor table just outside the window from our indoor spot. Personally, I never would’ve recognized the kid. But Josh is a Star Wars freak. His bedroom is full of the toys, posters and action figures that helped make George Lucas a rich man. In an attempt to score points with my young nephew—a great, sensitive kid who I see all too little—I walked over and asked Christensen if he’d take a picture with my nephew. We can stop by and say hello on our way out and you make a kid’s day. And that’s how it played out. Josh got to meet one of his heroes. I got to take a couple more digital pictures. Our waiter got a bigger-than-normal tip. 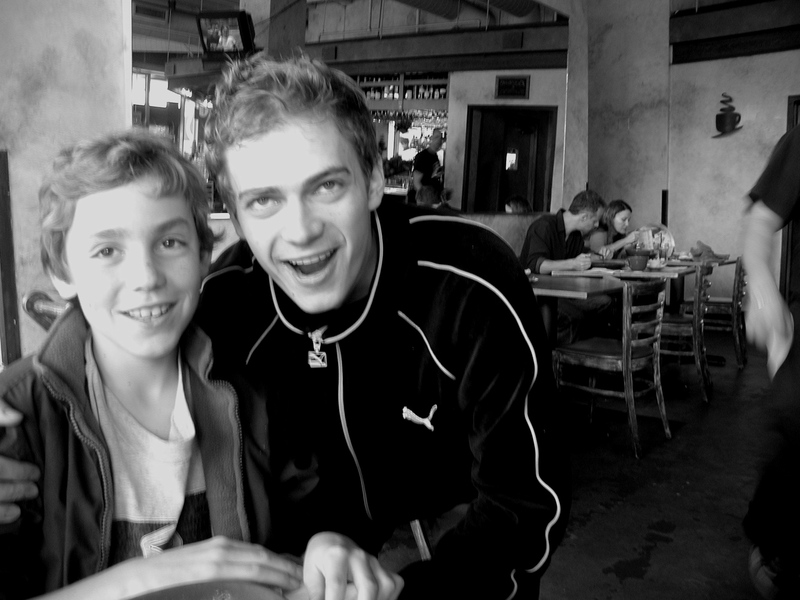 Hayden Christensen got his ego stroked by a 6th grader from Mission Viejo. Everybody was happy. The reason I’m relating this story is because today is Josh’s birthday. And since I didn’t send him a birthday card, I figured I’d try to make up for it by posting a picture of Josh and the big movie star on my website. Even if it did take me 3 weeks after his birthday to post the damn thing. Happy birthday, Josh. I’ll get you next year.